Our plans were to go on to the Grand Canyon after the convention so I had Sunday evening to paint after everyone else headed home. I found a nice little spot to set up and began this painting. When I was finishing up another artist bounded down the hill and introduced himself as Thomas Jefferson Kitts! He had a friend with him named Brenda Boylan and all of a sudden I had some painting buddies!! It was a highlight of the convention for me. Gods awesome creation, paint, canvas and new friends who love plein air painting. Nice to have someone to laugh and share it with! 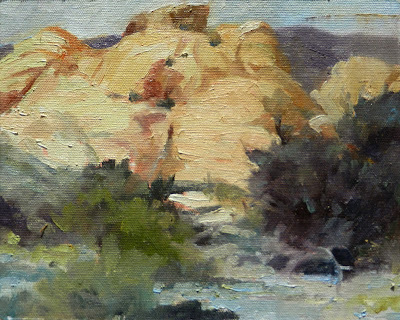 I scouted a great spot for painting while driving through the Red Rocks on the first day we arrived. I went back to that spot on the second day of the paint out. It was a beautiful location and I set my camera up to try some videos. It's kind of a series .....And my first try at this!....... Well,..I have two more vids as I progress, but apparently Blogger will only allow me to upload one video at a time .......sheesh! (Tip Section)...=]....After completing a few paintings it was discovered that I had forgot to bring something to store my wet paintings for the trip home. So, after discussing it with my wife it was decided that I would go to Home Depot and find something. I ended up with several flat cardboard boxes. Which I cut up and constructed a box with shelves to protect the wet work...The tip is....Do Not leave your wet-painting box on the table , in the camp ground unattended! The ravens thought there might be something tasty in it and proceeded to peck holes all over looking for tid-bits!...Tip #2....Don't try and pick debris out of your wet painting until it is Dry!....Oh...and Duct Tape....Don't leave home without it!!! Labels: First Annual Plein Air Convention and Expo, plein air oil painting, Red Rock Canyon plein air painting. 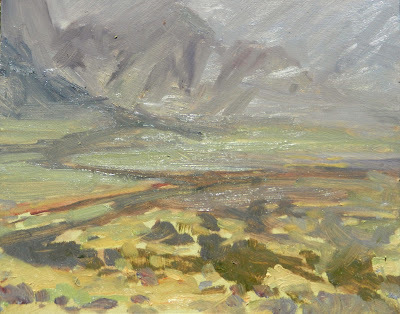 This is the second one I did on the first day of painting at the same overlook....Still rainy and misty! I want to try and pass on some of what I learned at the convention and one bit of wisdom picked up was that my blog should not be a Rob-fest....in other words you guys don't necessarily want to read a bunch of self promotion by me....My blog should be about you! What you would like to know about me or maybe learn from me...right? That's kinda tricky because I do want to promote my work which is pretty essential to how I make my living...but I also want to keep you interested and coming back ....so if you have the time drop me a note and let me know what you really like reading about. One of the first demonstrators was Richard Robinson. 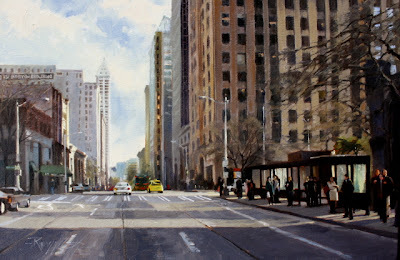 He is a very successful plein air painter from New Zealand. One of the things that has brought Richard a lot of attention besides his amazing artwork is his ability to teach his process using videos and social media. I met Richard when we were on our way to the Vermillion Cliffs. 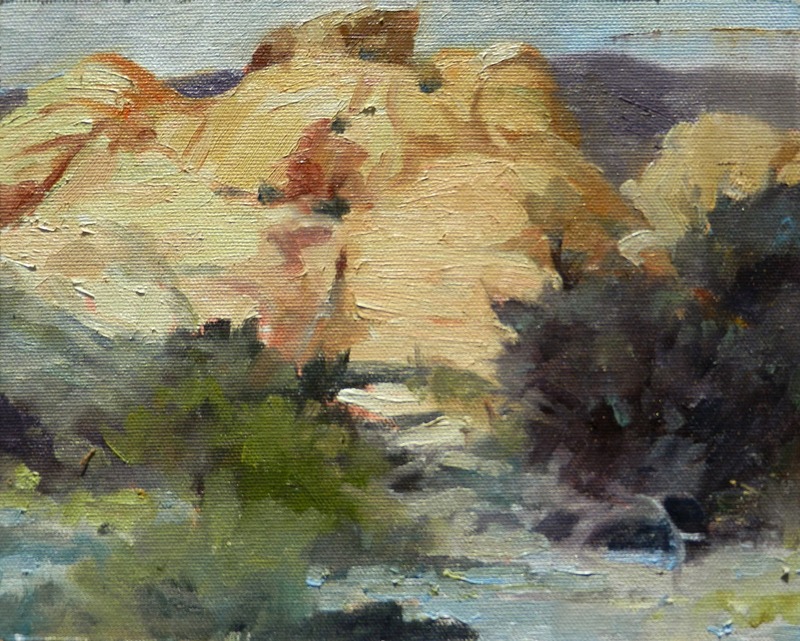 He was painting the canyon with another artist from Australia and invited me to paint with him..I'm sorry I didn't! But We wanted to get to the cliffs....You can order Richards excellent videos here. There is some free stuff too!...see.... I told you he was a good marketer!.. 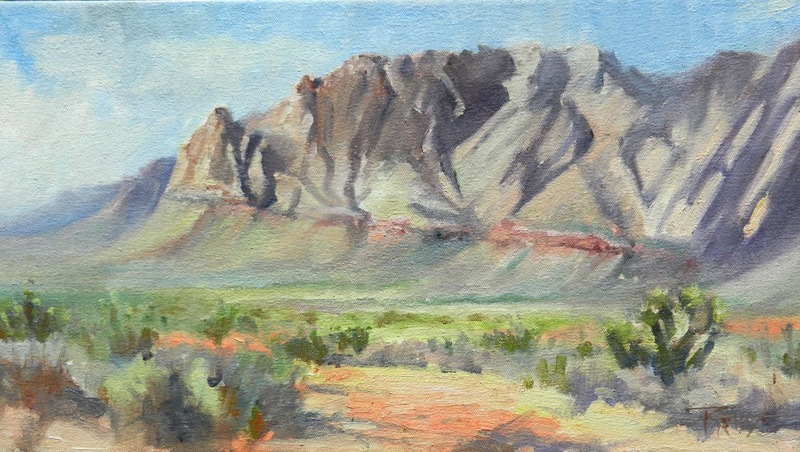 Labels: First Annual Plein Air Convention and Expo, Red Rock Canyon plein air painting. Well....now that we are back home I can post all about the First Annual Plein Air Convention and Expo held at Red Rock Casino and Resort in Las Vegas. We have been gone about 12 days and took a whirl-wind tour of the Grand Canyon and Zion National parks. 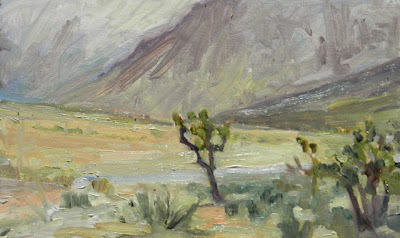 I did nine plein air paintings on this trip in some extreme conditions. 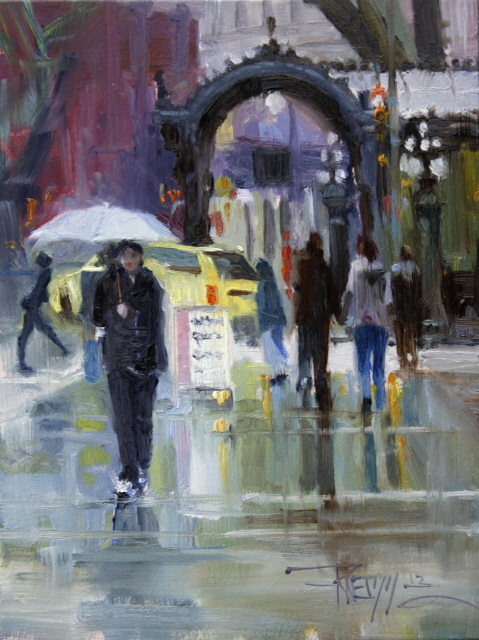 These paintings are meant to be studies and color notes for larger paintings. As you can see in this study the weather during the first few days was wet. Rain and mist kept blowing through the canyon and changed by the minute. I don't recommend this for anyone else ....but....I have this bad habit of resting my camera on the steering wheel while driving down city streets. I snap pictures without really looking at what the camera is getting and then sort it all out later... This can be dangerous if you don't have a lot of practice doing it....You have to concentrate hard on what is going on around you without focusing on the camera but just hitting the shutter....This painting is a compilation of some of those images. You can see the Smith Tower in the distance and on the left is the Metropolitan Grill. For a long time the Smith Tower was the tallest building in Seattle. 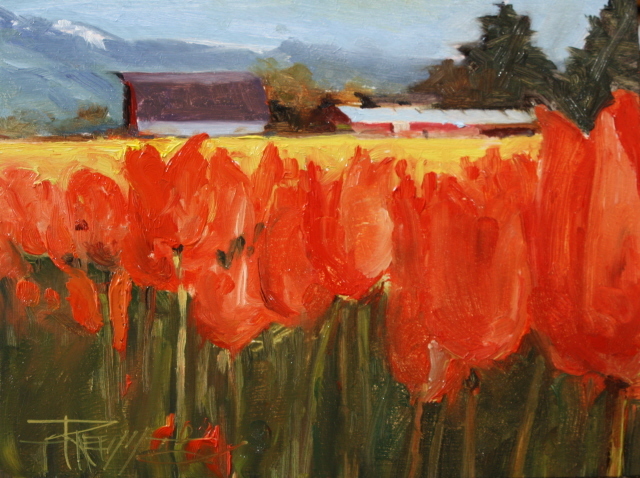 "Tulip Farm" LaConnor flower field, landscape oil painting by Robin Weiss"Tulip Farm"
Well, I have decided that tulips are HARD to paint! Especially red tulips! This is another one that I tried to get the sense of being down among the flowers in the field .......not so successfully....The problem is I wasn't happy with the foreground tulips so I totally over worked them. I think that I did better with this view. 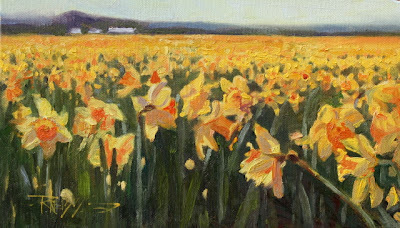 I tried to develop the foreground daffodils in this study to get a sense that you are right down among the flowers. I have been watching the early fruit trees coming into blossom the last few weeks and wanting to paint them. Every time I got out the PA gear with a break in the weather hoping to paint, the sky would go black and the wind would pick up and I would be back in the studio looking through my reference photos. 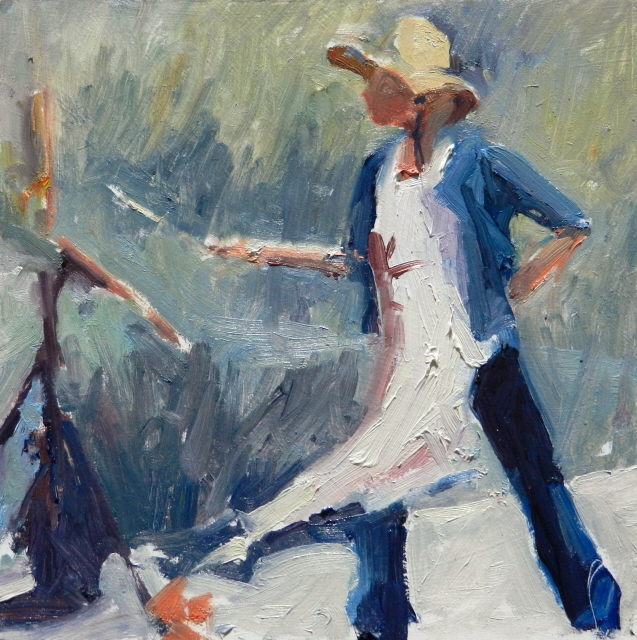 I found my images from a trip to LaConner in 2010 and decided to paint a few spring inspired paintings. This completes the Pergola rainy day series...for now anyway....The weather is finally shaping up around here and I want to go out and paint! I do have a few paintings done from pictures I took in Laconor of the flower fields to post. 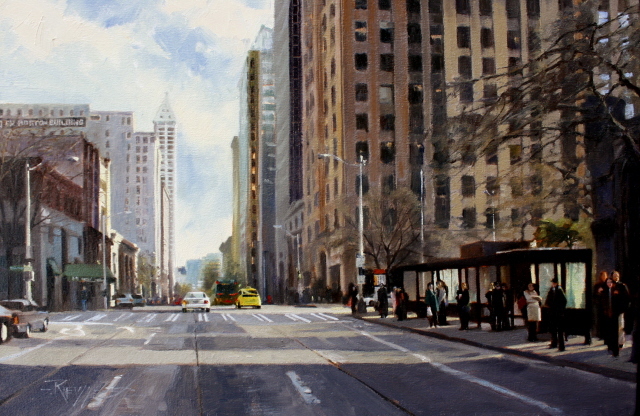 These paintings were done for Bluewater Artworks spring show. After that maybe we can get down to some real plein air painting! 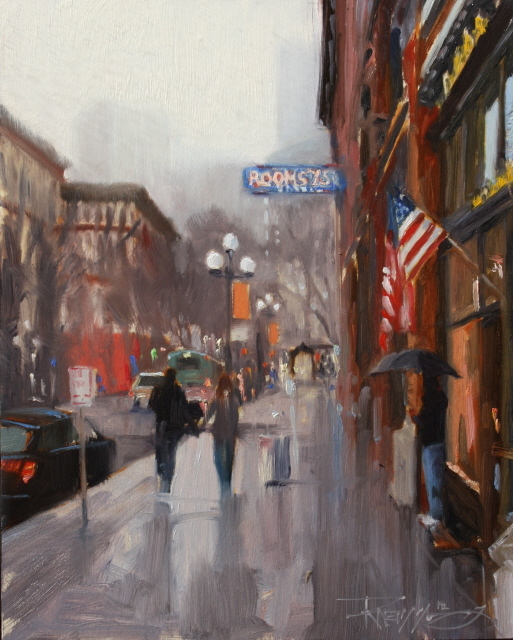 I really enjoy trying to capture these rainy day scenes ...HERE is another one from the archives....a large 60x40 commission piece I did a few years back...It is now hanging on the 16th floor of the Four Seasons Hotel in Seattle. 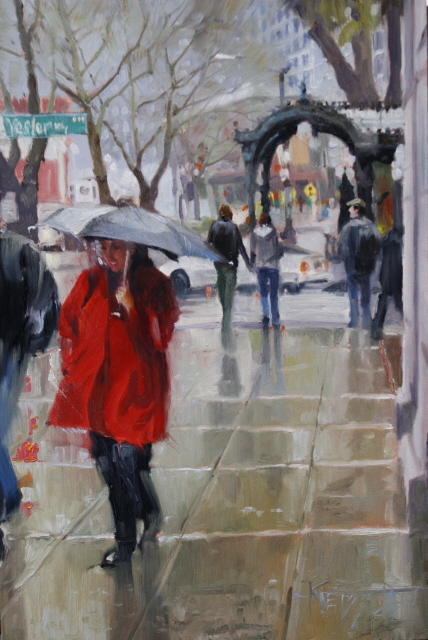 The next in this series.... features happy people with umbrellas, walking in the city with the Pergola as a backdrop....I hope this painting lifts your spirits a little ....especially if you live in the Northwest where we have been getting our fair share of rain! 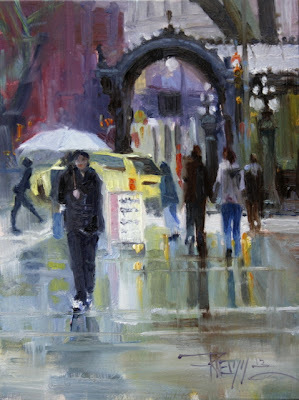 Labels: Pergola, Pioneer Square, Seattle city oil painting, umbrellas in the rain.